To reach this cemetery, from Cherokee, Alabama, turn north off US Hwy. 72 W. onto Main St. Go to stop sign and turn right (east) onto Old Highway 72, (Old Lee Hwy.) Go about 1 block and turn left (north) onto North Pike Rd. and go across the railroad tracks. Travel 4.4 miles to Mhoontown Rd. Turn right onto Mhoontown Rd. and travel about 1.1 mile to the church and cemetery. This cemetery is in the far northwestern end of Colbert County, Alabama. 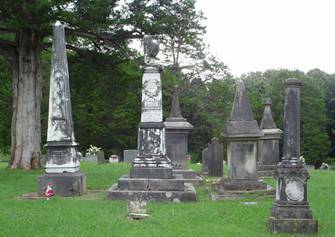 The cemetery was established in the early 1700’s and is owned & maintained by Mhoontown United Methodist Church. The oldest person buried here was born in 1729. There are about 45 unknown graves in the cemetery. According to a Mr. Bob Ables, (recently deceased) the church was established around 1828. The cemetery is in good condition and still in use. As most old cemeteries are, the grave plots are misaligned somewhat. There is some room left in this cemetery for future burials. The cemetery sign honors deceased Manard Askew for his efforts in establishing the cemetery maintenance fund. Adams, Altemont; b. 04 Mar 1900, d. 16 May 1910, son of R.O. & M.
Adams, Mattie; b. 23 Aug 1869, d. 28 Aug 1916, wife of Robert O.
Allison, Mary E.; b. 28 Jan 1851, d. 02 Jul 1931, wife of N.B. Anderson, Calvin; b. 1875, d. 1920, husband of Mary E.
Askew, Dan H.; b. 05 Sep 1910, d. 10 Oct 1944, husband of Thelma M.
Askew, Elizabeth M.; b. 26 Feb 1804, d. 12 Jul 1884, wife of L.B. Askew, Lucy; b. 19 Mar 1908, d. 16 Sep 1995, wife of Thomas J.
Askew, Thelma M.; b. 29 Aug 1916, d. 07 Jul 1997, wife of Dan H.
Bayless, Annie E.; d. 11 Jul 1883, daughter of Rev. W.B. and M. D.
Bayless, Emma J.; b 22 Sep 1880 d. 17 Oct 1881, daughter of Rev. W.B. and M. D.
Bayless, Fountain M.; b. 07 Feb 1882, no death date, son of W.B. & M.D. Bayless, Martha D.; b. 04 Apr 1853 d. 07 Jul 1886, wife Rev. W.B. Bayless, Mary L.; b. 06 Dec 1870, d. 05 Jan 1887, daughter Rev. W.B. and M.D. Beard, Ellen; b. 19 Jan 1829, d. 10 Jan 1912, wife of C.S. Bendall, Birdie J.; b. 21 Jun 1886, d. 01 Jan 1968, wife of Louis D.
Bendall, Edd E.; b. 18 Sep 1908, d. 18 May 1975, husband of Salana S.
Bendall, Louis D.; b. 05 May 1884, d. 16 Jun 1970, husband of Birdie J.
Bendall, Salana S.; b. 19 Apr 1912, d. 24 Nov 2001, wife of Edd E.
Benson, James F.; b. 04 Nov 1867, d. 02 Mar 1890, son J. & S.H. Benson, Lucy; b. 27 Oct 1876, d. 20 Oct 1886, daughter of J. & S.H. Borden, Infant; b. 01 Feb 1920, d. 11 Mar 1910, son of J.E. & P.J. Borden, James E.; b. 11 Mar 1879, d. 19 Nov 1956, husband of Plina J.
Borden, Plina J.; b. 17 Sep 1881, d. 02 Sep 1928, wife of James E.
Borden, Rosa Belle; b. 10 Dec 1876, d. 07 Mar 1925, wife of Jeff J. Brown, infant; d. 1879, son of R.M. and M.S. Brown, infant; d. 1886, daughter of R.M. and M.S. Brown, Lucy F.; b. 25 Nov 1877, d. 28 Jul 1963, wife of William T.
Brown, Nora L.; b. 25 Apr 1887, d. 18 Jul 1888, daughter of W.M. and S.F. Brown, S.A. (Askew); b. 11 Jul 1833 d. 10 Jan 1983, wife of W.I. Brown. Brown, W.I. ; b. 15 Feb 1836, d. 02 Apr 1911, wife of S.A.
Brown, William T.; b. 15 Jun 1869, d. 21 Feb 1961, husband of Lucy F.
Clark, Ernest M.; b. 09 Sep 1899, d. 20 Feb 1921, son of A.N. & S.A.
Cochran, Celia; b. 12 Apr 1943, d. 07 May 1943, daughter of Mr. & Mrs. W.A. Cochran, Gene; b. 04 Jun 1935, d. 08 Apr 1936, son of Mr. & Mrs. W.A. Cochran, Mary Rossie; b. 08 Oct 1864, d. 24 Aug 1923, wife R.F. Collum, Amanda M.; b. 15 Apr 1850, d. 30 Nov 1914, wife of J.T. Collum, Charles Jr., b. 13 Jan 1926, d. 19 Jan 1929, son C.W. and K.M. Collum, Charles W.; b. 21 Dec 1889, d. 28 Aug 1971, husband of Katie M.
Collum, Homer E.; b. 21 Dec 1910, d. 01 Jul 1974, husband of Nannie A.
Collum, Katie M.; b. 24 Sep 1892, d. 31 Mar 1979, wife of Charles W.
Cornelious, Mary Lillian; b. 04 Oct 1895, d. July 10, 1925 Wife T.W. Davis, Eva; b. 01 Feb 1888, d. 09 Feb 1940, wife of George O.
Davis, John R.; b. 04 Mar 1886, d. 21 Jan 1975, husband of Katherine F.
Davis, Katherine F.; b. 29 Oct 1870, d. 06 Aug 1941, wife of John R.
Davis, Willie M.; b. 16 Nov 1897, d. 26 Jan 1918, wife of J.H. DeGraw, Will; b. 1869, d. 1955, husband of Mary E.
Dill, F.M. ; b. 25 Nov 1912, d. 28 Aug 1913, son of E and J.
Dill, M.J.; b. 07 Dec 1907, d 12 Feb 1908, daughter of E. and J.
Dill, W.E. ; b. 07 Mar 1906, d. 18 Jul 1921, son E. & J.
Dobbs, Albert M.; b. 09 Mar 1880, d. 23 May 1946, husband of Martha E.
Dobbs, Martha E.; b. 09 Jun 1883, d. 23 Jan 1964, wife of Albert M.
Elliott, infant; b. 27 Mar 1916, d. 27 Mar 1916, son of S.E. & M.A. Elliott, infant; b. 13 Jan 1917, d. 13 Jan 1917, dau of W.L. & P.V. Franks, Hardin D.; b. 1900, no death date, husband of Nettie H.
Franks, Nettie H.; b. 1915, d. 1967, wife of Hardin D.
Glover, Bertie A.; b. 05 Jan 1890, d. 13 Mar 1976, wife of Sam M.
Glover, infant; b. 14 Nov 1919, d. 14 Nov 1919, son of W.J. & E.L.
Glover, Sam M.; b. 13 Sep 1888, d. 14 Apr 1968, husband of Bertie A.
Glover, Velma V.; b. 05 Sep 1923, d. 31 Aug 1924, daughter W.J. & E.L.
Granbery; William d. 21 Aug 1808. Hathcock, Lueiler; b. 18 Mar 1899, d. 02 Apr 1928, wife of W.M. Hearn, infant; b. 02 Feb 1916, d. 02 Feb 1916, son of L.W. & E.M.
Hearn, infant, b. 13 Jan 1917, d. 13 Jan 1917, son of L.W. and E.M.
Hearn, infant; b. 10 Sep 1933, d. 10 Sep 1933, son of L.W. & E.M.
James, T.S. ; b. 16 Jul 1871, d. d. 21 Feb 1890, son of W.C. and M.E. Jarnagan, Charlie B.; b. 1877, d. 1953, wife of Charlie P.
Jarnagan, Charlie P.; b. 1875, d. 1973, husband of Charlie B.
Jarnigan, Ora Lee; b. 27 Sep 1896, d. 03 May 1967, wife of Roscoe N.
Lang, Gussie May; b. 30 Jul 1902 d. 27 Feb 1904, daughter O.E. and M.B. McCaig, Annie; b. 14 Oct 1858, d. 19 Feb 1929, wife of W.E. Medford, John J.; b. 02 Jun 1881, d. 06 May 1945, husband of Ida R.
Messer, Ada M.; b. d. 10 Apr 1883, 22 years old at death, wife of F.M. Mhoon, James E.; b. 06 Apr 1821, d. 16 Feb 1868, son of J.G. and E.
Mhoon, John; b. 11 Oct 1831, d. 25 Jan 1837, son of Lucinda I. and William S.
Mhoon, Mary; b. 5 Oct 1858, d. 11 Nov 1861, daughter James. E. and Mary A.
Mitchell, infant; b. 22 Dec 1920, d. 22 Dec 1920, dau of M. and R.D. Morris, Ethel M.; b. 10 Apr 1892, d. 22 Jun 1970, wife of Joseph Y.
Morris, George W.; b. 21 May 1931, d. 02 Jun 1931, son of Joseph Y. & Ethel M.
Morris, Homer; b. 16 Jun 1912, d. 21 Jul 1989, husband of Bessie L.
Morris, Joseph Y.; b. 01 Jan 1870, d. 18 Aug 1949, husband of Ethel M.
Morris, Mary Adell; b. 24 Feb 1923, d. 16 Nov 1942, daughter of Joseph Y. & Ethel M.
Narmore, Laura A.; b. 21 May 1882, d. 17 Nov 1938, wife of Mark E.
Narmore, Mark E.; b. 24 Jul 1882, d. 27 Aug 1954, husband of Laura A.
Nichols, infant; b. 06 Dec 1926, d. 06 Dec 1926, daughter of S.O. & R.P. Nichols, infant; b. 06 Apr 1953, d. 06 Apr 1953, son of S.O. & R.P. Odle, Monroe C.; b. 26 Feb 1885 d. 19 Mar 1899, son of J.O. & S.J. Rickard, Eva; b. 04 Aug 1904, no death date, daughter of Mr. & Mrs. O.J. Roden, Blanch G.; b. 28 Jan 1902, d. 13 Apr 1992, wife of Neal A.
Roden, infant; no dates, daughter of Neal A. & Blanch G.
Roden, infant; no dates, son of Neal A. & Blanch G.
Roden, Neal A.; b. 04 Jul 1898, d. 27 Oct 1970, husband of Blanch G.
Sherrod, John H.; b. 12 May 1877, d. 21 Mar 1926, husband of L.A.
Sherrod, L.A.; no birth date, d. 20 Jan 1913, 31 years old, wife of J.H. Smith, infant; b. 27 Feb 1925, d. 27 Feb 1925, son of M.S. and M.L. Thompson, infant; b. 29 Jul 1917, d. 29 Jul 1917, infant of Mr. and Mrs. J.W. Thompson, James H.; b. 11 Aug 1910, d. 21 Mar 1913, son of Mr. &Mrs. J.W. Turberville, Gertrude; b. 06 Apr 1917, d. 15 Oct 1989, wife of Lacy R.
Turberville, Louise; b. 17 Feb 1920 d 13 Oct 1921, daughter of Silas R. and Minnie L.
Turberville, Minnie L.; b. 15 Jan 1888, d. 24 May 1969, wife of Silas R.
Turberville, Silas R.; b. 10 Dec 1887, d. 29 Jul 1967, husband of Minnie L.
Wadkins, Cora Lee; b. 03 Jan 1903, d. 07 Jun 1938, wife of Hamley L.
Wallace, infant; b. 22 Jul 1929, d. 22 Jul 1929, son of A.M. & M.W. Wellington, Addie; b. 1900, no death date, wife of Ruben L.
Wellington, Dollie M.; b. 10 May 1898, d. 24 Jan 1981, wife of Fred E.
Wellington, Fred E.; b. 09 Aug 1896, d. 16 Oct 1975, husband of Dollie M.
Wellington, James Lester; b. 03 May 1925, d. 22 Sep 1947, son of R.L. & E.A. Wellington, Mary W.; b. 1880, d. 1943, wife of Sam C.
Wellington, Sam C.; b. 1874, d. 1940, husband of Mary W.
Woodard, Dorothy Fay; b. 10 Jan 1926, d. 29 Apr 1928, daughter of R.A. & C.G. Worsham, Emma; b. 02 Aug 1865, d. 05 Aug 1934, wife of J.T. Worsham, Hilda Mae; b. 03 Apr 1899, d. 23 Oct 1977, wife of Jessie L.
Yerbey, Dora A.; b. 15 Jun 1877, d. 10 Feb 1944, wife of Henry B.
Yerbey, Henry B.; b. 27 Jul 1865, d. 07 Apr 1931, husband of Dora A.